Bolivia's army has begun using the revolutionary motto "Fatherland or death, we shall overcome! ", angering some conservative former generals. President Evo Morales introduced the slogan, which was popularised by Fidel Castro and Che Guevara - the leaders of the Cuban communist revolution. It is seen as part of Mr Morales' effort to turn the army into guarantors of his socialist revolution. Bolivian troops executed Che Guevara, who led rebels there in 1967. 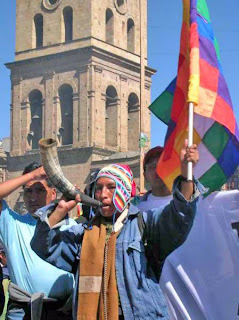 The Bolivian army began using the chant "Patria o muerte, venceremos!" on Tuesday, during an annual ceremony known as the "Day of the Sea". It is observed to remember the 1879-84 war against Chile, during which Bolivia lost its Pacific coastline. The BBC's Andres Schipani in La Paz says the rebranding of Bolivia's armed forces - which have historically been associated with right-wing repression - has sparked controversy in some conservative military and civilian circles. He says Mr Morales has also ordered the army to give official recognition to the chequered indigenous flag, or "wiphala". Since his election victory in 2005, President Morales has been pushing through reforms to place indigenous peoples at the heart of the Andean nation's government and society, our correspondent says. Everybody knows that the slogans of the Bolivia's Army is "alive bolivia, toward the sea" in order to make aware to recover the costline we lost during the Chile usurpation that took place on 1789.Unfortunaly the Bolivian President has very bad advisers in his gouverment and he has been made so many mistake as a leader of the Bolivian Forces.